Inventive though they may be, FX has a habit of over-saturating promotion for new series with countless teasers that inevitably blend together. American Horror Story does this year after year (even when a majority are acknowledged to be nonsense), and so too has promotion of Legion come to rely so sharply on the show’s trippy nature and arresting visuals. Legion should be the exact right series for that approach, but on a long enough timeline, you’d be forgiven a bit of ambivalence (even uncertainty) what the show is actually about. Going in armed with the facts isn’t necessarily a guarantee, either. In Legion, Fargo creator Noah Hawley brings us into a narrative loosely affiliated with the X-Men universe, starring Dan Stevens as an institutionalized man awakening to the idea of his schizophrenia as manifestation of nigh-omnipotent mutant powers. That awakening ends up spurred by the arrival of fellow patient Syd (Rachel Keller), whose own gifts tangle both up with a group of benevolent mutants offering to hone their gifts and use them against a sinister government division pursuing them. Sounds simple enough, right? 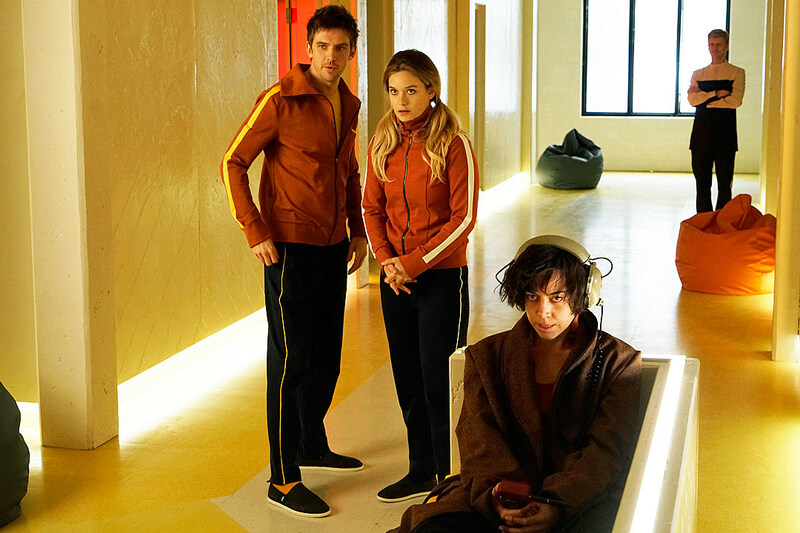 It might be, save the fact that Legion’s 90-minute debut presents that information in a very disjointed, schizophrenic manner that’s as equally brilliant as it is polarizing. Visually, Legion is stunning and immersive, with Noah Hawley displaying colors evocative of everything from Pink Floyd to Wes Anderson and Stanley Kubrick in terms of sensory flourish. It may well be the most gorgeous thing ever put to television, but could also leave you as jumbled as David himself, for want of an active story. That may be by design. What Hawley does tremendously well is to place Legion firmly within David’s perspective: full of nonlinear memories, distortions and tangents that immerse the viewer in some vivid emotions. There’s the wide-eyed, slow-motion gazes and warm intimacy of David’s time with Syd (set amiably to The Rolling Stones’ “She’s a Rainbow”), the claustrophobic, horror-tinged glimpses of the demons pursuing David in his own mind, and errant whispers that seem to come from all directions. You’re rarely certain of which scenes are meant to take place in present day, let alone reality, and I get the sense the Westworld and Mr. Robot crowd will have a field day unraveling these threads even further. Stevens too brings a mesmerizing and disparate presence to David, as anyone observing post-Downton Abbey roles like The Guest can certainly attest. Balancing Stevens’ twitchy warmth is a playful sadness to Keller’s Syd, whose aversion to, and eventual yearn for physical contact feels like a more thoughtful exploration of Rogue than the movies ever had time for. Aubrey Plaza too clearly has a ball as Lenny, David’s addict pal and fellow patient, but – without spoiling anything – it’s a tad opaque how the character will fit into the series overall. The second and third episodes shown to critics do offer a much stronger sense of how Legion will operate as an ongoing narrative, as well as open up characters like Jean Smart’s Charles Xavier-esque Melanie Bird and Jeremie Harris’ “memory artist” Ptonomy. Still, those not enraptured by the visual flourish of the series overall may find the story’s main thrust lacking; even a bit familiar. It’s almost verbatim “The Matrix with mutants,” as a shiftless loner starts awakening to the true nature of reality, and has to be rescued from shadowy bureaucrats by a group of like-minded rebels who see his gifts as The One the key to winning their secret war. They even perform tests on him with patchwork computer setups, and explore David’s mind with guided simulations of reality! Don’t get me wrong – I love any series with the visual panache to build a giant volume knob for a two-second insert of David learning to control his powers; I’m just a bit skeptical of visual flair and masterful direction papering over a few narrative shortcomings. There’s one character seen in flashes throughout the series that many will speculate as a take on a notable X-Men villain, though Hawley has been pretty adamant about keeping distance from that canon. Similarly, don’t expect any explicit nods toward David’s comic father. I’m on the fence as to whether Legion represents a reductive, or more nuanced take on mental health, but the series hopefully produces some thoughtful discussion. There’s an extended shot toward the pilot’s end that should offer some serious competition for directing nods. Seriously, the Matrix parallels you can draw are staggering. Legion will premiere Wednesday, February 8 with “Chapter 1,” airing at 10:00 P.M. on FX.